2 columns. Written Area: 39 x 78mm, 36 x 78mm, 13 x 75mm, 21 x 76mm. Column Width: 38mm. Number of Lines: 9, 9, 3, 6. Line Height: 4mm. Rubrication. Some bookworm damage. Column and line rulings. 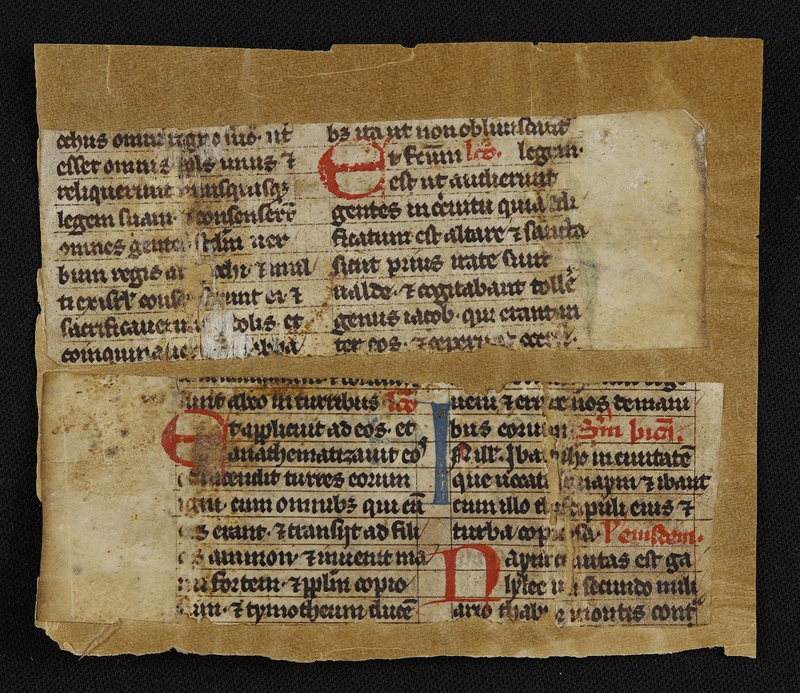 Gothica Textualis. Content: Chiefly Lessons from scripture for liturgical use. 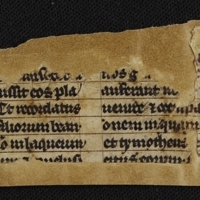 1st fragment contains 1 Maccabees 1:43-51 (<Anti>ochus omni regno...). 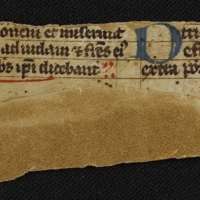 2nd fragment contains part of 1 Maccabees 5 and Luke 7:11, but Nayur ciuitas est galylee in secundo miliario... is not from the Bible. Fragments 3 & 4 have parts of 1 Maccabees 5. Have Colker's notes. 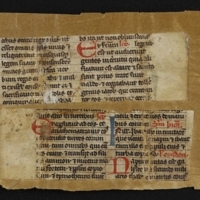 Physical Size: 4 parchment fragments (39 x 97mm, 36 x 99mm, 27 x 97mm, 32 x 84mm) glued to a piece of brown paper (152 x 105mm), which has broken into three pieces: 2 fragments, 1 fragment, 1 fragment.